Before the errata, Brionac, Dragon of the Ice Barrier may have taken the #1 spot in this countdown. Generic Level 6 Synchro materials needed, the lower ATK than other Level 6 Synchro monsters didn’t matter, it was all about the effect. Pitch any number of cards to spin back cards to the hand. You could do this as many times as you wanted in a turn, essentially clearing the opponents field and opening up OTK opportunities. Anything that worked in the grave works well with this card. They may have limited it to once per turn, but that still gives you the potential to spin back cards you need to spin back, fill your grave, gain advantage through your grave and potentially dominate your opponent. With Cold Wave back in the day, this card had far less to worry about for needing to spin back. You’d Cold Wave, then likely have to spin back two monsters at most. This card was a one-card summon with Rescue Cat. You also still had Giant Trunade which then didn’t lock you out of spells and traps for the turn. It may have been changed to once per turn, but Brionac is still a great Synchro. Easy to summon, easy to use, two traits you look for in a Yu-Gi-Oh card. I don’t think it will ever lose its playability completely. Brionic, Dragon of the Ice Barrier is a generic Level 6 Water Dragon-type Synchro Monster with 2300 Atk and 1400 Def. Fortunately, errata didn’t kill a good card here. The stats are still good and the summoning requirements are easy being 1 Tuner and 1 non-Tuner. The effect is a hard once per turn that costs cards in your hand to send the same number of opponent’s cards from their field to the hand. It doesn’t look like this version of the effect targets, which is great. It’s also good that there are no Battle Phase restrictions. If you happen to run tuners this is a good Synchro option. It is unnecessary at unlimited, but I’m glad Brionic still rates so high on our list. Yay, we get to look at another errata, only this time one where the errata wasn’t as rough on it. From the original Hidden Arsenal, we have Brionac, Dragon of the Ice Barrier. Brionac is a Level 6 WATER Sea Serpent Synchro with 2300 ATK and 1400 DEF requiring one Tuner and one or more non-Tuners. Stats are ok for a Level 6 though we have seen better on some Level 5s and 6s. Sea Serpent is ok, but WATER is great. First off, I’ll discuss the pre-errata Brionac just like I did for DSF. You can discard any number of cards from your hand to target and return any cards on the field to the hand equal to the number of cards discarded. This was just begging for loops and Future Fusion really helped when looped with this as well as Premature Burial. This wasn’t a hard once per turn either, so you could keep going with this effect and not discard too many cards at once in case of a Veiler. This was also good for clearing the board to go for game and was banned before Mermails and Atlanteans came out. If it had the pre-errata effect, it would be 5/5 and still banned, but we did get an errata which makes the card solid still. Now, the effect is a hard once per turn and you can only target the opponent’s cards. Other than that, you can still discard as many as you want to bounce whatever you want. Still good for clearing multiple threats, but now you cannot loop your own cards and you can’t bounce multiple times in case something new comes up. Brionac is still good, just now it is far more balanced. 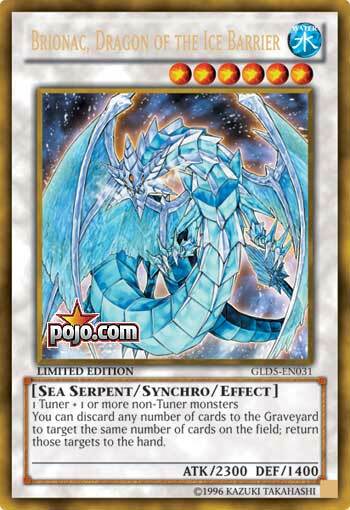 Art: 5/5 Really love the Ice Dragon, might be the best of the Ice Barrier Dragon trio. Brionic, Dragon of the Ice Barrier, was a lot of fun to use and abuse…once Banned, and having seen several Erratas. The key change to note in Brionic is that it no longer is able to return YOUR cards. That’s not a huge downfall, but it was a big differential between this card (and say) Trishula. (Even if the latter doesn’t require the discard here). Level 6 is very easy to make Synchro wise, and much as we learned from a Monarch named Raiza, it can be just as effective to bounce cards as it is to destroy. Brionic helps clear the Field in order to move for the kill, so long as you have the cards required to spin the ones you don’t want on the Field…well, off. I don’t feel it’s a terrible downside that he can’t bounce your own cards anymore, but it does hurt it. Obviously, this was done to help curtail some of the abuse Brionic could do. Was it too far? Well, it was enough to drop a card from Banned to Unlimited status. Brionic could still be fun to use today, and as stated, Level 6 Synchros are still incredibly easy to bring out. Play around, see if he works for you. Cards like this are what happen when effects are too broad without many limits. No once per turn clause, as well as being able to recycle you own cards, while still being a generic Synchro, made this card a bit overtuned on top of the OTK potential it had. This version of the card is perfectly fair. The versatility of the bounce effect, plus the potential for life point damage that still exists, still makes this a viable option if a LV6 Synchro is being considered.